Over the years I’ve heard many calls for “a new story” to replace the old one of the dominant paradigm. The idea of a new story to replace the old paradigm is appealing because people seem to have a need for stories to make sense of the world, and to orient ourselves within it. We all tell ourselves stories all the time. We remember narratives better than we do abstract information. And, as explained on the Deep Ecology and Paradigm Change pages, a sacred, transformative story seems especially needed at this time. The New Story of the Universe—otherwise known as the new cosmology, the universe story, the great story, or simply the new story—is such a transformative story. 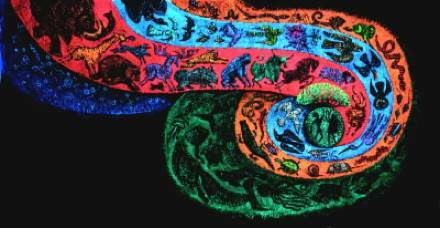 This is the story of the evolutionary journey of the Universe and the Earth. The Universe Story is based on what 20th century physics discovered about how the universe has organized and generated itself since the Big Bang. Evolution is big news that has hardly scratched the surface of the dominant worldview and the institutions that rule our world. 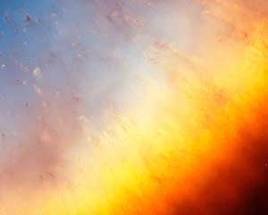 The challenge to incorporate the evolutionary dynamics of the universe and of life into our worldview could be regarded as the crux of the paradigm change that we are in the midst of; for the fact of evolution — of ourselves and our Earth and our universe — has still barely penetrated the mass consciousness of our species. There are still legal battles raging in the United States about whether evolution should be taught in public schools. Not only do Christian fundamentalists want to believe that God created the world (the universe!) a mere 6,000 years ago, plus or minus, but the mistaken notion that the universe is fixed and unchanging — like a clock that would tick for eternity — is the bedrock of the dominant mechanistic paradigm inherited from Isaac Newton. Absurd as it now may sound, an unchanging universe is nevertheless a fundamental tenet of belief in Western Civilization. Even 20th century physicists didn’t want to believe that the universe had evolved over time, and that it is expanding. The famous story that Brian Swimme tells in Canticle to the Cosmos is that Einstein came up with the equation that showed that the universe is expanding and he couldn’t believe it. So he changed the equation. Years later, Hubbel called Einstein and said, ‘Come and look through my telescope. I want you to see something.’ Hubbel showed Einstein that the universe is expanding. It was a shattering moment — not only for Einstein, but for all 20th century physicists. Einstein later said that changing that equation was the biggest mistake of his career. Among other spokespeople for the new story of the universe are Duane Elgin, Barbara Marx Hubbard, Tom Atlee, Michael Dowd, a former evangelical preacher, and his wife Connie Barlow, a scientist. Michael and Connie lived 'on the road,’ traveling around the United States telling the new story of the universe in town halls, churches, synagogues, schools, and wherever there was an audience. Michael’s essay The Big Picture: The Larger Context for All Human Activitiesshows the continuity between the new story and deep ecology. As Swimme, Berry, and Dowd say, industrial civilization (based on the old mechanistic paradigm) is bringing an end to the Cenozoic Era that began 65 million years ago with the demise of the dinosaurs. Swimme says that, along with the fact that the universe is evolving and expanding, the fact that the human species caused the unraveling of the Cenozoic era will remain ‘news’ for a million years. This unraveling of the biosphere has taken place within a mere two centuries of industrialization. Of course, industrialization with its amazing technological advances has also made it possible for humans to see ourselves and what we have been doing in radical new ways. And this is also part of the new story. The new story provides us with a “deep time” perspective: from the flaring forth of the universe to the profound implications of our present moment for the future of life on Earth. But this new story also shows us that we are an expression of the Earth—we are the Earth’s creative imagination. Through human consciousness, the Earth and the universe are now able to reflect on themselves. Never before has it been possible for humans to realize that our role is to celebrate and embody the evolutionary dynamics that gave birth to our species. It is challenging to take this all in. The new story is one of the most profound topics in deep ecology or in any other context. It affects everything. Michael Dowd provides a good, annotated bibliography on both the new cosmology and deep ecology at the end of The Big Picture: The Larger Context for All Human Activities. However, as challenging as the new cosmology is, it also provides hope and direction for our species; for it provides the real Big Picture, the real context for human belonging within the universe. The universe is not a machine composed of dead matter in which human consciousness is an accident and the human soul is the only living thing, as the old paradigm would have us believe. Could it be that the Universe is in fact conscious and ensouled, as ancient spiritual traditions and indigenous wisdom have affirmed all along? More and more scientists are finding evidence that this is the case. If the glorious Cenozoic Era—which birthed almost all of the millions of species that have existed since the die-off of the dinosaurs—is coming to a close, what’s next? Thomas Berry has identified two possibilities. The first, most obvious, possibility is a ‘Technozoic’ era, in which humans would continue to push the mechanistic paradigm to its logical conclusion, which is ecocide and human extinction — a rather miserable finale to the human experiment. He called the alternative the ‘Ecozoic Era,’ the era in which the human species will mature into being a viable partner with planet Earth, capable of maintaining ‘mutually enhancing relationships’ with the rest of the community of life on this planet. The Center for Ecozoic Studies, which is dedicated to promoting and realizing the Ecozoic Era, created an online “Handbook for Ecozoic Study” a few years ago. Unfortunately, it is no longer available online, but it included Herman Greene's "Twelve Understandings Concerning the Ecozoic Era," which is still a relevant summary of the ecozoic vision. 1. The Unity of the Universe. The universe as a whole is an interacting community of beings inseparably related in space and time. From its beginning the universe has had a psychic-spiritual dimension. The universe is a communion of subjects not a collection of objects. 2. Modes of Expression. The universe expresses itself at all levels through communion (intimacy, interrelatedness), differentiation (diversity), and subjectivity (interiority, self-organization). 3. Cosmogenesis. The universe is a creative, emergent, evolutionary reality that has developed from the time of the primordial flaring forth, and is still developing, through a sequence of irreversible transformations. 4. Earth. Earth is a one time endowment in the unfolding story of the universe. 5. The Current Dilemma. The effects of human activity on Earth have become so pervasive and invasive that the survival and health of the Earth community now rest on decisions being made, and actions being taken, by humans. 6. Transition to the Ecozoic Era. There is a need to move from the current technozoic period where Earth is seen as resource for the benefit of humans, to an Ecozoic Era where the wellbeing of the entire Earth community is the primary concern. 7. The New Story. The New Story, the narrative of the evolutionary development of the universe from the primordial flaring forth to the emergence of the Ecozoic Era, provides a unifying myth for all human cultures and a basis for common action in the realization of the Ecozoic Era. 8. Bioregionalism. Bioregionalism, care for Earth in its relatively self-sustaining geo-biological divisions, reorients human activity in developing sustainable modes of living, building inclusive human community, caring for the rights of other species, and preserving the health of the Earth on which all life depends. 9. Ecological Spirituality. Ecological spirituality, presence to the primal mystery and value of nature and to Earth as a single sacred community, provides a basis for revitalizing religious experience and healing the human psyche. 10. Women, Indigenous People, Science, and Humanistic and Religious Traditions. The wisdom of women, indigenous people, science and classical humanistic and religious traditions will have an important role to play in redefining concepts of value, meaning and fulfillment, and in setting norms of conduct for the Ecozoic Era. 11. The Earth Charter. The Earth Charter provides a comprehensive set of values and principles for the realization of the Ecozoic Era. 12. The Great Work. The epic task, or “Great Work,” of our time is to bring into being the Ecozoic Era. It is a task in which everyone is involved and from which no one is exempt, and it will require change in every aspect of human society. On it the fate of the Earth depends, and in it lies the hope of the future. There are three reasons. First, the New Story awakens a sense of the awe and mystery of existence and of our participation in the cosmological order of the Universe. Second, the New Story reconnects the self (and so restores the self) with that which is more primordial than family, tribe, clan or nation—the self’s relationship with the natural world from which it came and of which it is a part. Third, the New Story provides a unifying mythology for all human cultures and a basis for common action in the realization of the Ecozoic Era. If we take all these together, we might think of the New Story as an important part of the “knowing” dimension of an Ecozoic Society. As a part of the knowing dimension, the New Story involves knowledge of the scientific and historical discoveries of the 19th and 20th centuries that made possible the telling of the story. These discoveries include, among others, the laws of thermodynamics; the theory of evolution; the theories of special and general relativity and of the relationship of time, space, motion, matter and energy; quantum mechanics; modern astronomy and the theory of a time-developmental universe; cellular biology, genetics and the discovery of DNA and RNA; and advances in mathematics and computational science and modern archaeological, anthropological and historical studies that have vastly expanded our understanding of human history. As Swimme and Berry have said, the New Story is the Copernican Revolution of our time. It is a narrative expression of a set of understandings primarily derived from science and history that are transforming human consciousness and reorienting the human community within the larger community of life. The narrative is important in its own right, but it is only the tip of the iceberg. The New Story, as any adequate myth of origin and purpose must, expresses an inexhaustible mystery. But the creative aspects of this mystery for humankind may best be activated when appreciation for the mystique of the narrative is combined with understanding of the new science and history on which it rests, and the implications of this new science and history for our role in the world. If humanity is to succeed in making the Great Turning it will need to have a unifying vision and a new story of our species’ role in this planet. The new cosmology and the vision of an Ecozoic Era provide such a grand, unifying, and scientifically grounded vision and understanding. Those who are moved to comprehend this new story and great vision, embody it, and bring it into public consciousness will do and are doing the Great Work. I call them Dharmagaians. 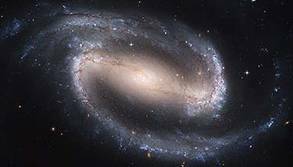 See New Cosmology Links for readings and resources on this important new development for our species. *Note: A nebula is an interstellar cloud of dust, hydrogen gas and plasma. It is the first stage of a star's cycle. 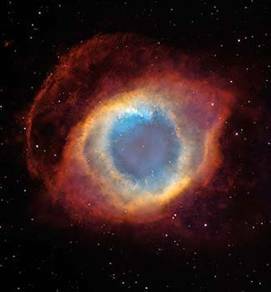 Originally nebula was a general name for any extended astronomical object, including galaxies beyond the Milky Way (some examples of the older usage survive; for example, the Andromeda Galaxy was referred to as the Andromeda Nebula before galaxies were discovered by Edwin Hubble). 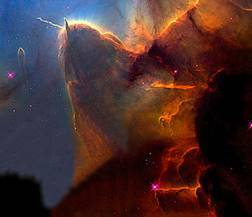 Nebulae often form star-forming regions, such as in the Eagle Nebula. 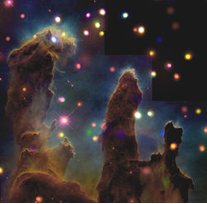 This nebula is depicted in one of NASA's most famous images, the "Pillars of Creation". 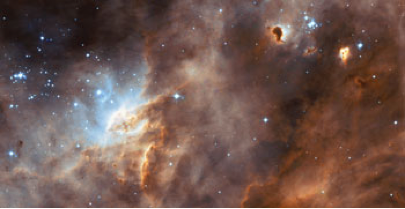 In these regions the formations of gas, dust and other materials 'clump' together to form larger masses, which attract further matter, and eventually will become big enough to form stars. The remaining materials are then believed to form planets and other solar system objects.